What’s worse than a costly attack on your website? 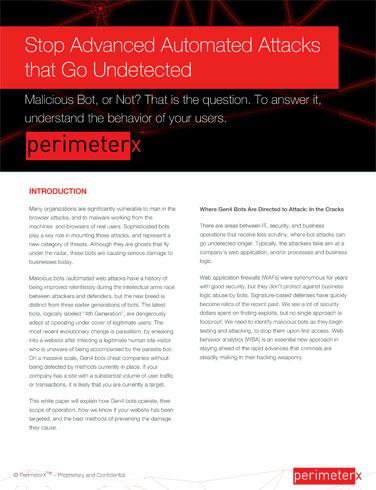 Answer: Large-scale automated next generation bot attacks you never detect. Today, many businesses are being damaged by hard-to-stop next generation bot attacks. These are ghosts that fly under the radar. This new breed is dangerously adept at operating under cover of legitimate users. Read how they have leapt ahead of Gen 1, 2, and 3 bots, and how they are deployed ingeniously to extract money from your company, often without triggering security.